What happens when large herbivores disappear from landscapes? Much of my research to date has used the extinction of the Pleistocene megafauna as a natural experiment, documenting the cascading effects of the loss of large herbivores on the plant communities they left behind. To do this, I marshall the paleoecological record preserved in lakes, reconstructing plant communities with fossil pollen. Megaherbivores are a bit trickier. Since the fossil bone record is spotty through space and time, I’ve instead used a different “proxy” to reconstruct the presence and absence of megaherbivores: a genus of dung fungus called Sporormiella. Sporormiella is coprophilous (e.g., “dung loving”), which means it has to go through herbivore digestion in order to reproduce. Using these spores, which are also preserved in lakes along with pollen, I’ve shown that the extinction of the Pleistocene megafauna contributed to the formation of novel plant associations and altered fire regimes in the Midwestern United States. Top: A bison wallow surrounded by prairie forbs and a grazing lawn, Konza Prairie. Bottom: An ungrazed portion of Konza Prairie. How confident are we that these dung fungal spores are recording what we think they are? What if they’re actually influenced by massive population cycles of ground hogs, or deer? The extinction of the Pleistocene megafauna was more than twelve thousand years ago, so this is not a trivial question. To test the effectiveness of the Sporormiella proxy, I went to Konza Prairie, which is home to one of the last surviving native megaherbivores in the Americas: bison. This month, I’ve got a new paper out in the Journal of Ecology that uses Konza’s bison enclosure experiment to test how well Sporormiella represents 1) the presence and absence of bison (it does! ), 2) whether the abundance of spores are linked to bison grazing intensity (it is!). We also found that the spores don’t disperse very far from their source, which means that we can be confident that Sporormiella is a robust and local signal of large herbivore presence in the paleoecological record. We also showed that the signal from megaherbivores is detectable even above a background of smaller animals, like hares or deer. Evidence of past cycles in moisture availability, vegetation composition and fire dynamics is not mutually exclusive with the modern evidence that bison grazing is a critical determinant of grassland community composition and function. One possible way to reconcile these lines of evidence is to consider that climate variability is regulating both bison populations and behaviour and grassland composition during the Holocene, but that bison act as a key mediator of the effect of climate on vegetation during drier conditions. 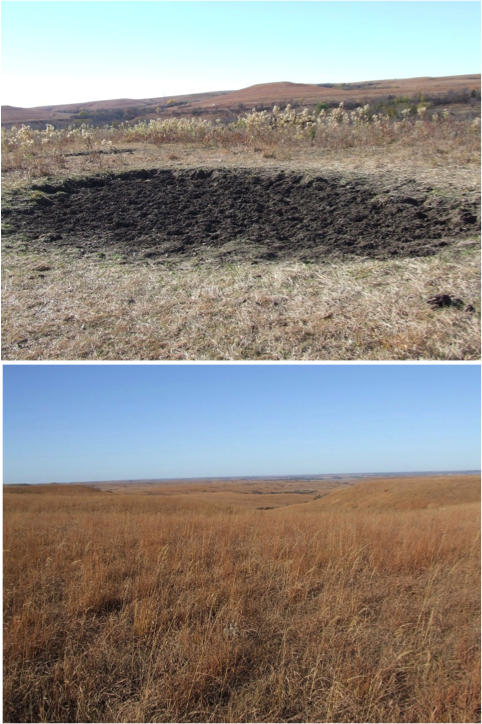 In this hypothesis, drought would act to alter the spatial heterogeneity of the effect of bison on grassland composition, while bison act to enhance the relative abundance of Ambrosia during dry conditions, by both (i) reducing below-ground competition for water through selective removal of grasses and (ii) increasing the production of wallows and other disturbed patches, which provide optimal Ambrosia habitat during drought conditions (McMillan, Pfeiffer & Kaufman 2011). 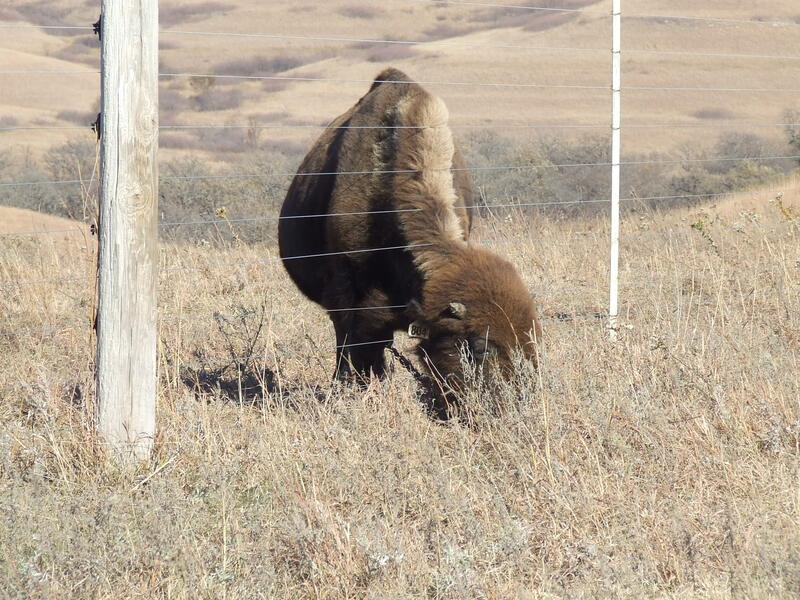 A bison at Konza prairie, blithely ignoring the grazing treatment. With Sporormiella, fossil pollen, and charcoal, we can actually test this hypothesis, which wouldn’t have been possible using the vertebrate bone record alone. As a final note, I really enjoyed this study. First, as a paleoecologist, I don’t always get to actually see the landscapes or organisms I’m researching, and the opportunity to observe bison (and their impacts) up close was such a treat. Secondly, this paper was an experiment for me in open science. While the paper is not open access (sadly), we included all of my R code — my first, in fact! — and the data necessary to reproduce the results as a supplemental file, so anyone should be able to play with the data and recreate the figures in the study. And finally, this study (as co-author Simon Goring mentions) was inspired in part by a recent paper by Steve Jackson that urges us to avoid “ignorance creep” by explicitly exploring the linkages between proxy and inference in paleoecology. Proof-of-concept papers aren’t always glamorous (or easy to get published), but they’re important, particularly in nailing down what Jackson cites are the “known and unknown knowns and unknowns” in our fields. Thank you for another superb blog, and for demonstrating how present-day fieldwork can add crucial understanding to paleoecological studies.